How Can You Learn More About What People Really "Mean?" How They "Feel" About That Problem You Want to Solve? Try Doing Some Culture Probes! You could go and “hang out” and watch them. Capturing their stories at a listening session might work really well. Since people buy with emotions and justify with logic, what they say and what you see is very important — but how they feel is even more valuable for you to get the insights you are looking for. Culture probes are a “quick and dirty” way of looking into users’ thoughts, feelings and the meaning they are imparting onto things. In addition, culture probes are very engaging. They open up to you, the observer, what is going on in the minds of the people you want to know more about. And generally, people love to help you. 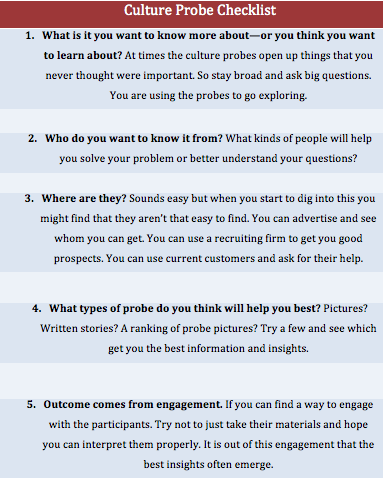 The culture probe process will help you capture what they are thinking about, how they feel about something, and what things think are related to each other. How to do a cultural probe? Here are two examples that will illustrate how culture probes are used. Then I will give you a checklist of the kinds of things you might put together to try one on your own. This is an excellent way to learn more from customers, prospects or people in the general market. Think of it as conversations that a person or groups of people are willing to capture and share with you. 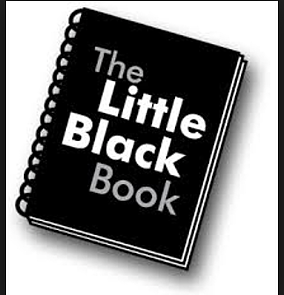 Give a person or a group a little black book and ask them to jot down specific information about something you are interested in. Perhaps for your company you want to know situations when the use of your product interferes with them getting something completed. Or maybe you want to know why they buy one of your products but not all of your products, and why they aren't loyal to you. Or, when does that new complex software become a problem to solve instead of a solution to a problem? 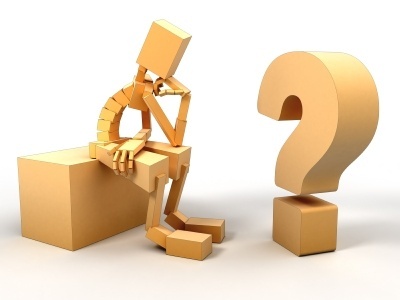 I can give you a list of situations in which getting a person to write about your product or service or solution in the context of how they are using it could uncover very important insights into how that interaction had meaning or pain for the person. Ask people to use their cell phones to take pictures of a situation and include them in a written diary. They can add comments or sound bites along with the images. Or they can pull together for you a Pinterest board all around the experiences they are having with something you want to know more about. Users can create something as simple as an audio diary on their cell phone with pictures through which, for a week or so, they tell you about specific situations.Ask them to tell you how they feel or what it is like when they interact with your product, relate to your service, struggle with a problem or work on a project. This is a great way to get them to capture how they feel at a particular moment and tell you about it in a story format. Online blogs sent to you also work well — with the added advantage that you can see what is happening to users in real time. These are all different ways to capture moments that have meaning. It is the meaning that you are looking for. It is hard to ask people, “What did that mean to you when it didn’t work the way you wanted our product to work?” Yet they are very happy telling you about it as it is happening. You will find it both easy to use and gratifying in the amount of information and insights you can garner. And, you will avoid the problems that memory plays in the situation. Memory takes a moment and recreates it, when what you are really trying to capture is the essence of its meaning when it is happening. 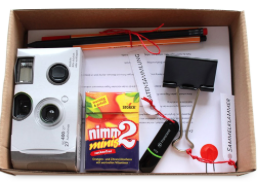 Participants have several days or a few weeks to “play with the probes” and then return the pack with their lists, ideas, experiences, videos, audio or other ways to capture how the pieces in the pack impacted their lives or their jobs. What is in the pack depends on what you are trying to learn more about. Don’t assume that the participants will have these items in their own personal lives. You want them almost to see them as a puzzle in which they are putting the pieces together to help you figure out what they mean. "Just realized I never actually posted about the results from my cultural probes. In April I deployed eight little kits to four couples. 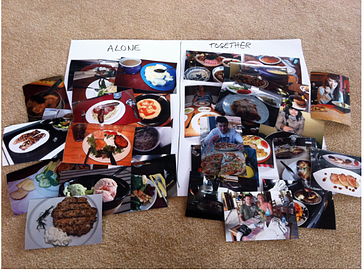 Each kit had a camera and a postcard to document their dining experience every day for 2 weeks. I got the kits back last month, after a fashion, and spend a good week or two working through the data. I paired each photo to its postcard to keep the image and the 'background info' together — but it’s true what they say about a picture speaking 1000 words…or whatever that saying is." What the researcher learned was both not unexpected but very revealing, shooting down assumptions and engaging the participants in the design of products and services around their lifestyles. "I got out some big sheets of paper and divided them up into whether the meal was being eaten at a dining table, or somewhere else (98% of the time this was the sofa, but answers also included ‘in bed’ and ‘in the garden’). What I found was, when people eat with their partners, the vast majority of the time it’s at a table, breakfast bar, or some sort of proper 'dining' place. When people are on their own, they tend to eat on the sofa or in a more casual way."